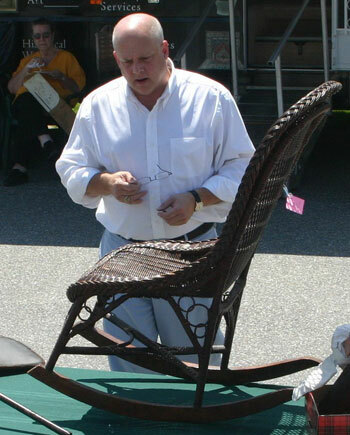 John Bottero of Thomaston Place Auction Galleries appraises a wicker chair. WILTON - On Friday, Aug. 3 from noon to 4 p.m., Thomaston Place Auction Galleries’ Mobile Appraisal Laboratory will roll into Wilton for an antiques appraisal fundraiser event in conjunction with the Wilton Blueberry Festival. The fair will be held on Main Street, and Thomaston Place appraisers Kaja Veilleux and John Bottero will provide instant appraisals for antique or collectible items brought to the Appraisal Laboratory. There will be a suggested donation of $10 per item or $25 for three items, and 100 percent of the proceeds will support the Blueberry Festival. Thomaston Place Auction Galleries’ Mobile Appraisal Laboratory is the first-of-its-kind, 36-foot-long motor coach equipped with state of the art appraisal tools and reference materials. Participants are encouraged to bring any items that they want to have appraised to the event. If items are too large to be transported to the coach, detailed photographs can be used to determine their approximate value. There are no appointments, and each person will have a chance to meet with an appraiser on a first come, first served basis.